Flash - my running number and chip number are both different. So either we're both knackered or it'll all be fine - I suspect the latter. Jokeybhoy - did you see that buses have been laid on to the start area? Free and from various locations, check out the race magazine for details. rodeoflip - great result at London, very impressive! Here's hoping those blisters heal up nice and quickly. Flash - feel free to take this with a pinch of salt, but either your long runs are too fast for your target time, or your target time is conservative. And who likes conservative, right?! Take care not to train at 'race pace' and slow the long runs by around a minute/mile to what you want on the day. The idea is to build up time on feet and stamina; your other sessions will be where you gain speed. The risk otherwise is you'll burn yourself out (and you're ill now ) or get injured, and your day will be painful. I ran Blackpool on Sunday, and it was unpleasant. My glute caused much of the issue, and my lack of preparation for the sun did the rest. I got round, but after the early stages got progressively slower and limped over the line in 3:29:55 by clock time. I feel pretty bad still, and have decided to pull out of Stirling. I know I'll be at least another fortnight with no running, and on top of the previous three weeks with nothing means my base fitness is plummeting. I wouldn't enjoy it, and I'd rather recover properly and be well for the autumn runs. Good luck with the last few weeks of training all - you're nearly there! Meadower - sorry to hear about Blackpool - it's a tough course, very exposed, but still a bit of a bugger to suffer like that. And sorry that you won't be at Stirling - I'm sure that was a decision not taken lightly, so you're probably right not to run. But must still be frustrating. Hope the injury sorts itself out and wishing you a quick recovery. Sorry to hear that Meadower. Heal quickly. Sorry to hear you are not running the Stirling Marathon. If i get anywhere near your Blackpool time (maybe by jumping on a bus half way round) I will be well chuffed. Congratulations on pushing through the pain barrier and completing too! I hope those blisters heal quickly and you are back running soon. Rodeoflip... "I seem to have one speed and one gear, I can run at that speed but find it hard to slow down or to speed up." This seems familiar to me. I find it really hard work slowing down to anything approaching 8min miles. 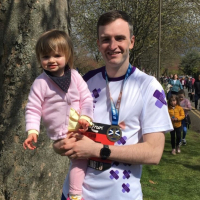 My training has gone well recently and am now in taper mode for Stirling ) Ran the Great Edinburgh Run last weekend and finished in 1.07 which I was really happy with. Set out to stick below 7 min miles and succeeded! Long run from Edinburgh to Bo'ness yesterday. I ran along the canal to Linlithgow then over the hill. That was actually very much sorer than my previous long runs. I'm guessing since it was flat pretty much all the way to linlithgow that my body took a beating. Slight groin strain, but i'm 90% confident it'll take care of itself over the next few days. Will rest for a couple of days and go for a cycle rather than run, then get back on the feet on Thursday. Looking forward to it now, if slightly nervous. Peter, I ran the canal to Linlithgow a couple of months back...I a bit monotonous but I enjoyed running to somewhere rather than just running a loop around the city for my long runs. Bravo for adding on a bit more! Thanks for the good wishes, all. I'll get there. Heal up quickly you lot; not long to go now! Couldn't make this up... went out on the bike to give the legs a rest, but keep the legs moving. A stupid woman decided to step right out in front of me resulting in an over the handlebars crash... landed on my shoulder so I now have a shoulder muscle strain to go with my groin strain. 2.5 weeks to go and i'm feeling things are going against me. Last week was running very well, this week feel like it's going to pot. Booked in for sports massage next week so hopefully that helps. Questioning wether I do my long run on Sunday now? Meadower, you're right about running to somewhere. Previous week I ran to North Berwick from Edinburgh. It was very enjoyable despite the headwind. Love how the pavement just stops at Dirleton and you have to run up that wee steep hill into the village. Oh no, Peter! That's pants. I'd probably bin the long run, as it is bound to put some strain on your shoulder, and you could do more harm than good. I managed to fall for the first time in my running career on my long run on Sunday. Just misjudged a kerb and went down. First thought was to check my (brand new) Garmin was ok (it was), then did a quick stocktake. All body parts intact, although somewhat less skin on my right palm and elbow. It was at mile 5 of 19, so I decided to keep going for a couple of miles (where I could take a shortcut home), to see how it felt. All was reasonably ok, so I kept going and finished the run. It got a bit nippy when the sun came out and the salt from my sweat got in the wounds, but otherwise all ok.
Healing not too bad, although my elbow is a bit sorer today. If it's not any better tomorrow I might phone the doc in case it's got infected, although I had a long sleeved top on which wasn't torn, so it should have been clean. Peter / Nessie - hopefully you will both recover in full very quickly... I still have this heavy cold and went for a 1hr run on the treadmill Tuesday evening - nearly killed me. Still full of gunk. I try to avoid running on trafficked roads as there are too many maniacs out there. Anyway, I am going to attempt a long run tomorrow before work so will leave the house before sun up. I would like to repeat the 22.5 mile run i did just over 2 weeks ago and then taper down. Completion of this distance is for both physical and mental reasons. I have also put a little weight on and will try and lose 1/2 st before the marathon. My main worry though is chaffing. I have now purchased runderwear and will use these tomorrow and vaseline my rigs under my arm where the chaffing is severe. Meadower - i will try and run a little slower, pace myself and hopefully feel good on completion of my last long training run. Porridge with a sliced up banana, some blueberries and a bit of maple syrup... mmmmmmmmm. I find this stuff great for anti-chaffing. Hi Peter - thanks! - I have just purchased this stuff from Amazon and will let you know how I get on. I am now over my heavy cold / flu thing but have not run a "long" run for some time. I will do a 20miler tomorrow - I know I should "taper" but feel the long run will be of benefit and there should be "just" enough time to recover for the marathon proper. I am presently liking porridge, raisins, apple and cinnamon. Flash - don't do it. Running 20 miles this weekend might give a psychological benefit, but it will do much more harm than good at this stage. You will turn up at Stirling with residual tiredness in your legs (even if you don't feel it at the time) and this will bite you in the race. I would run 10 miles max, and even then very slowly. The best thing you can do to prepare now is to rest. Sorry, but the time for training is over, even if you haven't been able to train as much as you would have liked. Just my 2p-worth, but please don't throw away your marathon for the sake of a training run. I agree with rodeoflip - it takes 3 weeks for the body to adapt to a long training run, so it's not going to do you any good fitness wise anyway. My plan has 8 miles for this weekend, then 5 miles easy Tuesday and Thursday (and I may pootle round Falkirk parkrun on Saturday, just for a wee shakedown). Totally agree with Nessie and rodeoflip to late for a long run of 20 miles, not that I'm an expert or that. I talk from experience I did the same before a London marathon had a horrendous training schedule and was trying to catch up and did a 20 miler 10 days before my legs felt dreadful on marathon day and I suffered big time. It will be an easy 10 miles for me this weekend before next week. My plan is similar to Nessie's. I'm still recovering from running Boston and London very close together and my legs still have some tiredness in them now. 8 miles planned for Sunday morning and may run a few easy miles next week but planning not to run at all. Better to be rested and under-prepared than over-trained and tired. Has everyone noticed that it's an early start (9am), and that the roads out to Blair Drummond are closed so the only way out there is on the shuttle buses? These are likely to be busy so it's looking like getting out there early might be a good idea. Yep, planning to drag the kids out of bed early, get hubby to drop me off and then they can all head back to the hotel for breakfast. I'll take some snacks with me for the bus. I'm in the last wave, so I'll be hanging around for a good while, but at least that'll give plenty of loo-queue time. Rodeoflip, Nessie, Steven - I ran 15miles this morning. Had plenty left in the tank and did this in 2hrs 3mins so now feeling a little better about things. I heeded the warning with regards 20miles... I was tempted but thought, "no! I am a novice and need to take advice from those experienced to know and advise." I actually feel fine, a little tiredness in my thighs and calfs... cold now basically gone. I am thinking of a few easy 5 milers Monday, Thursday and then nothing until Sunday. With regards shuttle buses etc. Bit of a pain actually and i agree that early is best but will mean hanging around fora long time. Do you think there will be snacks or porridge or something available near to the starting point? If not, looks like i will be bringing a flask of porridge oats! So, physio was encouraging. I do indeed have a wee strain, but with management i should be fine. I've managed a couple of 4 and 5 mile runs pain free this week and have an appointment with the physio again next week for a rub and stretch. Got exercises to do and am sticking to them. I'll cross train instead of the ten miler on Sunday and fit in another 3 or 4 shortish runs/jogs before Sunday. Feeling a lot more positive than I did at this time last week! The taper is dragging, more so I suppose since I didn't get my 16 miler in last weekend or have any sort of run last week. Planning on using the Prudential park and ride. There's nothing saying how to get back there after the run though, or indeed after a bite to eat and stroll around Stirling! Saw pictures of the underpass at Customs Roundabout... looks interesting. I also drove past the cycle path/pavement at the big roundabout between Dunblane and Bridge of Allan and the work to widen that has been done. The Glide stuff has come in the post. I will test it and hopefully use it next Sunday. Have a good w/e all. Flash, I know how hard it is not to bang a few extra miles in when you're feeling good and the sun is shining. But you will be glad come next Sunday that you didn't run those miles. Take it very easy this week - any runs this week really serve no purpose - they won't provide any fitness gains, but they may cause tiredness or tightness. If you didn't run at all until Sunday then this might not be a bad thing, if you do go out then take it very easy, maybe run with someone else and treat it as a sociable run, i.e.- you should be able to talk throughout. Try out the body glide and make sure you're happy with your kit for Sunday. Peter, sounds promising. Another week of recovery and hopefully you'll be fine. Jokeybhoy, that does sound like a nightmare, and not just "maranoia" - I hope your physio can get it sorted out. Mixed weekend for me. Had to swap my days round due to family commitments. Woke on Saturday quite sore (guessing from the physio on thursday), went onto the cross trainer at the gym for the first time and came off that totally pain free. Woke on Sunday completely pain free and went for a very slow plod as per physio and it came on again, so had a good couple of miles walk home. Feeling pretty low about it again - for the first time i'm considering not running the race. Just thought I'd drop by and wish everyone the very best of luck for Sunday, I am still not back running due to a stress fracture in my left shin ... (and to think I was worried about shin splints lol) no timescales, I have to wait until it's healed ... but hopefully soon. I'll be there on Sunday though to cheer on my brother-in-law who has trained superbly, considering he only ran his first 1/2M in Oct last year - I'm confident he'll get his 4hr target (the swine ) - he's less confident (we'll see I suppose). I'm looking forward to getting a feel for how it will be when i return to get this race next year - unfinished business - anyway ... good luck everyone. Good to hear everyone's comments on my first time on the forum. Sitting icing a tight calf as we speak but v excited about Sunday, hopeful all the buses to the start are well organised and looking forward to it!! Have learned so much on my training this time, mainly around training and recovery. Next time round I'll know a lot more! David, rest the calf this week and you should be fine. Forecast is looking good for Sunday - dry with a light breeze from the North to keep us cool. Just remember the 2 golden rules of marathons - don't do anything different on the day than you did in training (so no new kit or nutrition strategies), and don't set off super-quick because you feel full of energy. rodeoflip et al... I did 5 miles yesterday and 5 miles this morning.... just 40minute runs on the tread mil and will do a wee 3 miler on friday night after work to keep loose... bit of a glute pain on my left which extends down the left thigh but is manageable... going to rest up mostly now (other than small run friday night). I am becoming nervous and hope not to waste too much energy on the morning of the race thorugh nerves. Weather looks good and hopefully we can all meet or beat our targets. Sub 4hrs for me and I will probably break down and cry all the way home. So much running and preparation has gone into this and it will be some relief and joy to actually do it. I have not tried the body glide stuff but will use it on the day where I need to. Peter - I hope you recover and make the run on the day. Likewise with everyone. I think my biggest worry is the mentality of it. 1 mile at a time and going off sensibly without getting caught up with the adrenalin is defo something to watch out for! I don't want to be the person who doesn't make it. Thanks to ALL of you who have given advice (very much valued and appreciated). I have tried to take it all on board. I wish you all the very best for Sunday (due to work i need to travel down South for a few days but hope to be back in the office Friday). Will travel early on Sunday morning and find somewhere to chill until the 9:10 gun.